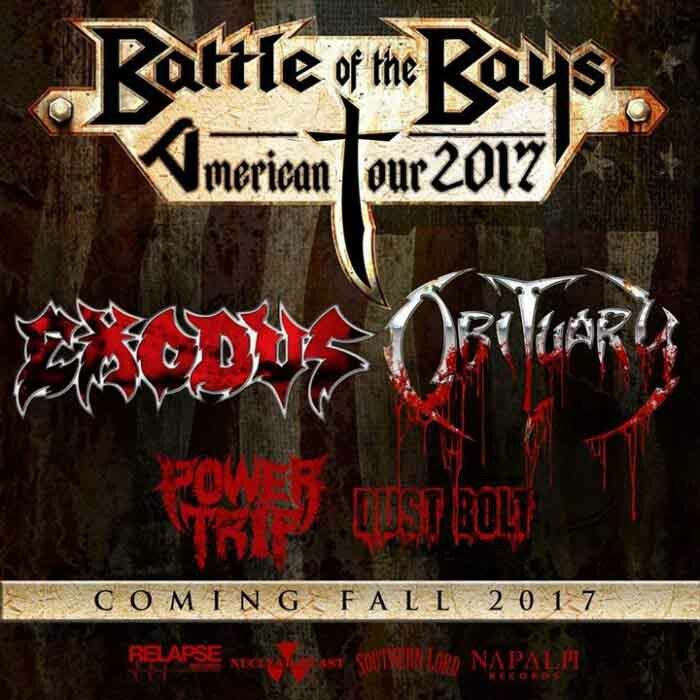 Obituary and Exodus have finalized the tour dates for their 2017 “Battle of the Bays” co headlining tour. 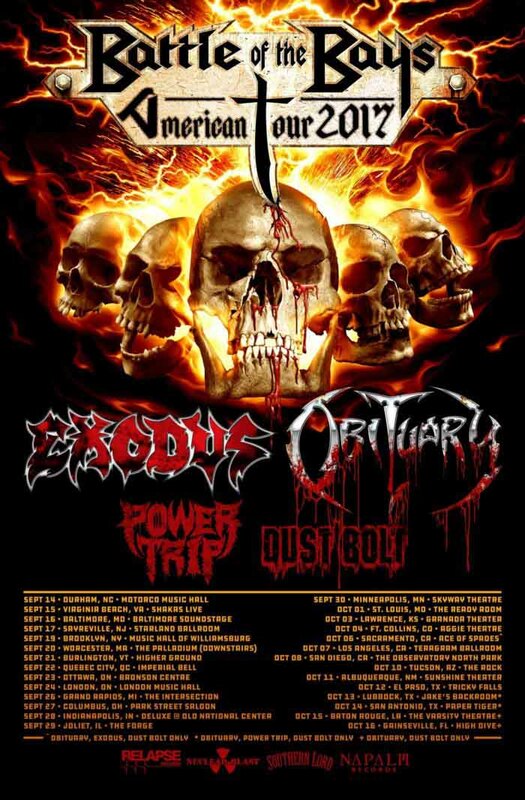 Obituary and Exodus are scheduled to tour the United States together later this year in the fall. The “Battle of the Bays: American Tour 2017” will have German speed metal band Dust Bolt opening along with the awful American metalcore band Power Trip. This probably will not be a great tour for underground metal fans but could be fun for beer metallers. 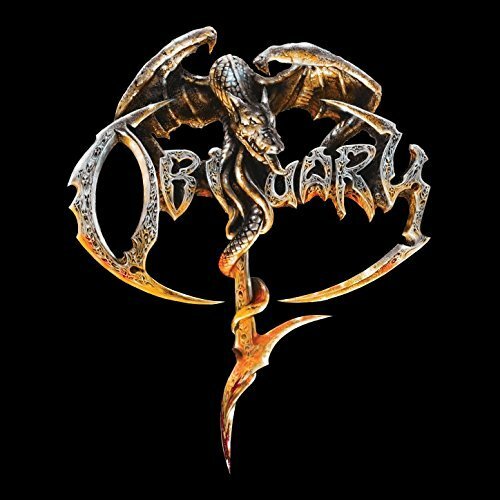 Obituary announced an upcoming self-titled album out May 17th on Relapse Records. Prepare for boring mediocrity and probable Sadistic Metal Review fodder. The preview sounds terrible. 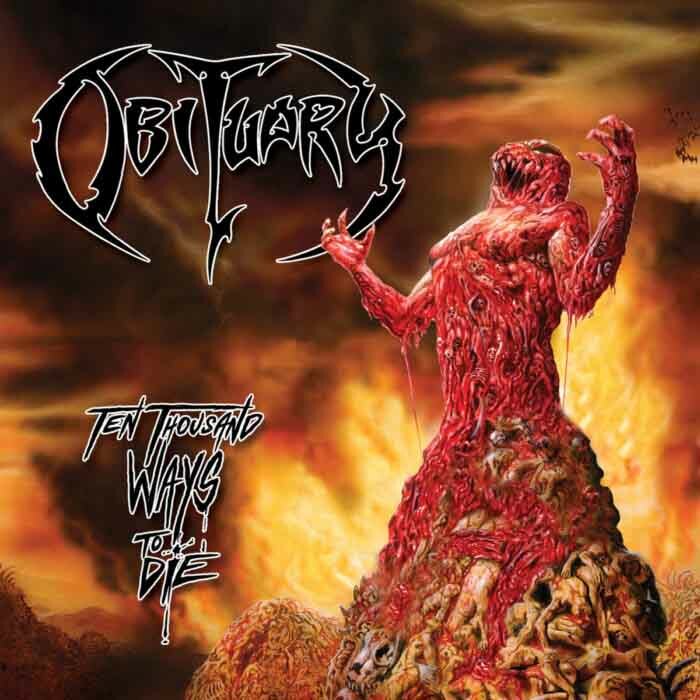 Relapse Records posted a new track, “Loathe”, from Obituary’s upcoming Ten Thousand Ways to Die album their Bandcamp page. It’s quite bland I assure you. 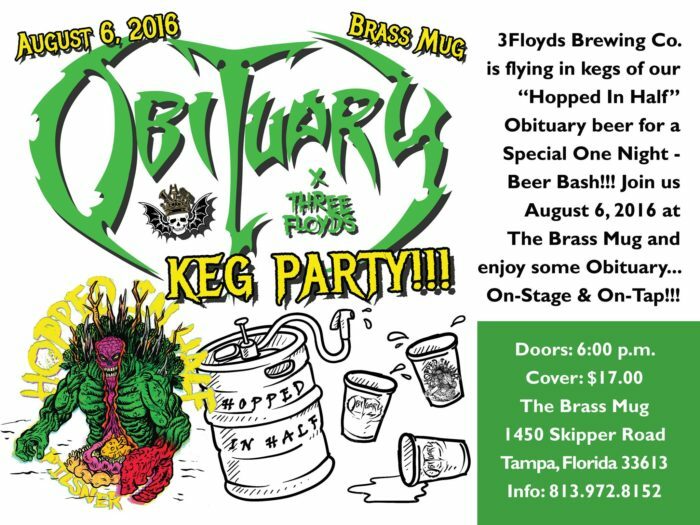 Obituary are throwing a kegger August 6th in Tampa with kegs being flown in from Indiana by the Three Floyds Brewery. More information is available on the Funbook event page. Ian Fraser “Lemmy” Kilmister of Motörhead (and formerly Hawkwind) passed away today. According to Motörhead’s Facebook page, Lemmy died after “…a short battle with an extremely aggressive cancer”; one that he had only found out about two days before his death. More information may be released in coming days. 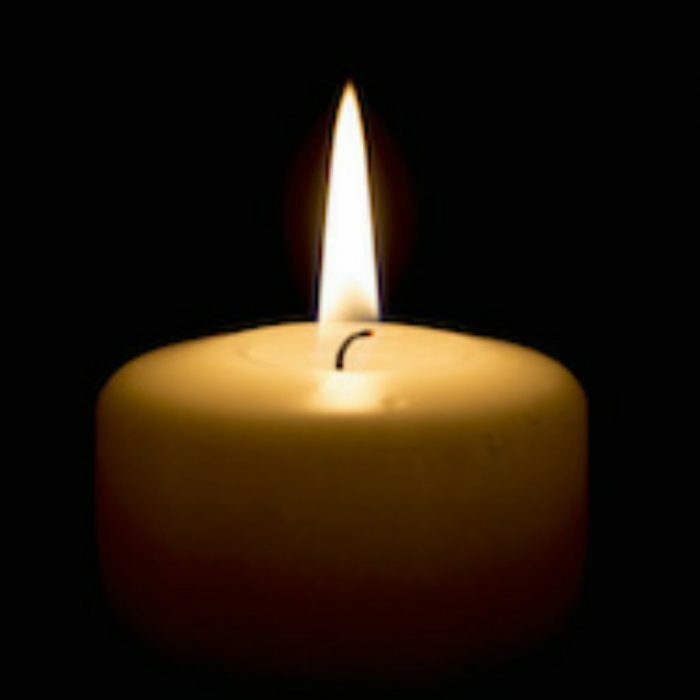 This death follows the recent death of Phil Taylor and puts a unfortunate note onto the band’s 40th anniversary. 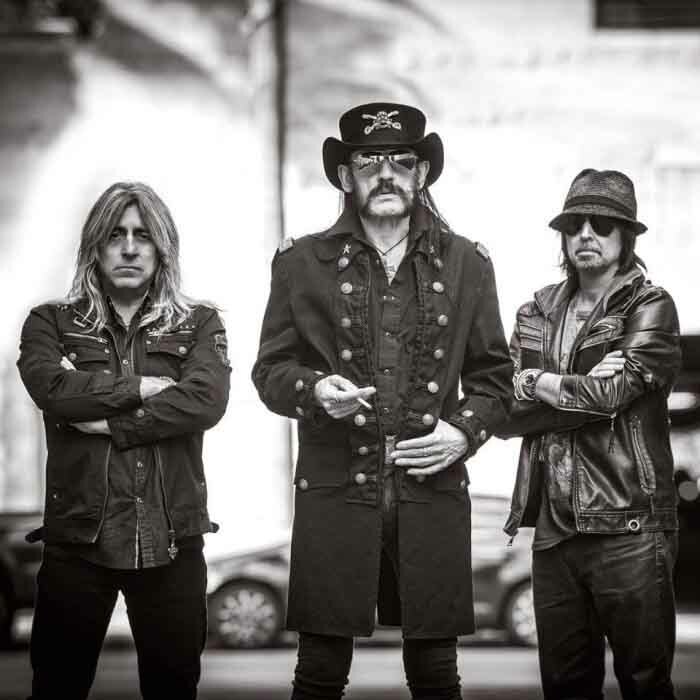 It is worth noting that Motörhead remained strong up to the very end, touring despite instances of bandmember illness and even releasing a quality studio album a few months ago. When you’re like us and operate on the assumption that most metal music is bad (or at least mediocre), you probably want to avoid Cannibal Corpse, since they’re still kind of the poster child of lame albeit studio-proficient death metal. In case you don’t, you can always see them on their upcoming US tour. 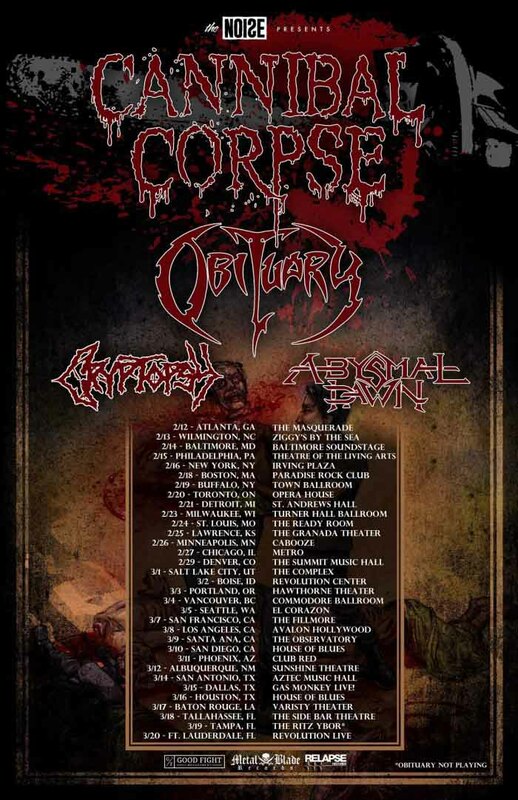 As mentioned in the title, Obituary, Cryptopsy, and Abysmal Dawn will be supporting them. The first two bands in that selection admittedly produced some good content in their early days, but seem to be operating at a similar level of tired rehashes these days. Tickets will go on sale this Friday (December 11th), so you should soon be able to ignore our warning if you feel doing so is absolutely necessary. 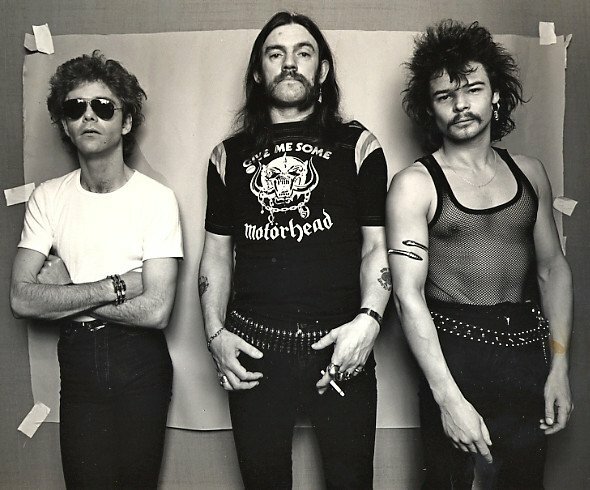 Phil Taylor, the former drummer for Motörhead, has passed away at the age of 61. So far, no cause of death has been disclosed. 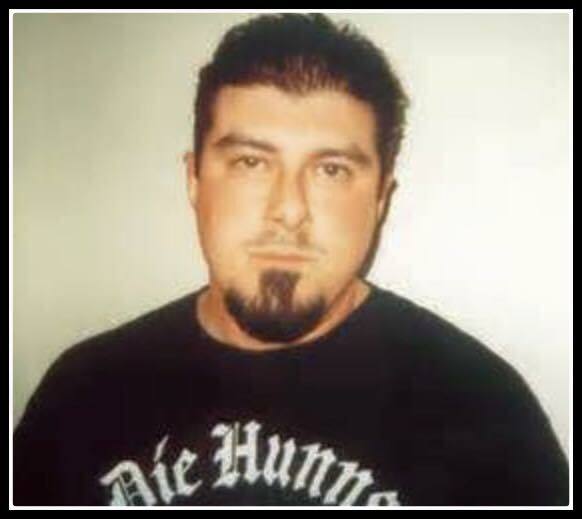 As one of the founding members of the band, he understandably had a major influence on metal drumming; in particular, he probably played a major role in popularizing the use of double bass drumming in some of the more extreme subgenres. On the other hand, the variety in Motörhead’s early material also speaks volumes on his ability to perform in some substyles beyond just proto-speed metal. Beyond his especially famous performance on Ace of Spades, Taylor also performed on every one of Motörhead’s studio albums until 1916, with the exception of Orgasmatron. Obituary has notified their fans and friends that Frank Watkins, former bassist for the group and later active in Gorgoroth, has passed away. Born on February 19, 1968, Frank moved to the next plane on October 18, 2015. His style of bass-playing aided Obituary in the creation of one of the greatest epics of death metal, Cause of Death, in which he achieved a sound like an earthquake moving through a mud layer that shadowed the detuned guitars and growling vocals for a subterranean, unearthly aesthetic. Since those days, Watkins moved on to play for and manage other metal bands, including most notably one reformation of Norwegian black metal act Gorgoroth. During his 47 years, he contributed quite a bit to metal both publicly and in private, and will be greatly missed.